I was particularly enthused, a few weeks ago, to read that Derrick was hosting the 9th edition of Is My Blog Burning? and that the theme he had set was terrines. Reason number one : Derrick The Talented is one of my absolute favorite food bloggers, I am always in awe of his uncompromising approach and his ambitious endeavours. 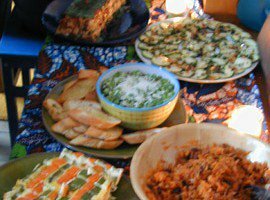 His was among the first food blogs that ever existed, and An Obsession With Food is one of the two or three blogs which inspired me to create Chocolate & Zucchini (another one being the now defunct Julie/Julia Project). Reason number two : the terrine theme. 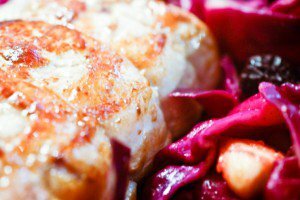 Terrines are particularly French, they’re versatile and fun (a bit like the French, yes? 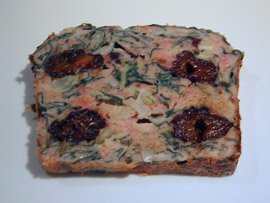 ), and I have derived much much pleasure in the past from creating my own little loaves of goodness, using my beloved bright red terrine dish. I am certain I’m not the only lover of words and etymology around here (oh and toponymy, too! ), so let me point out that terrine is, of course, a French word. It comes from terre, which means earth, and was initially the word for a deep earthenware dish, round or square, with a lid. In a typical case of metonymy, it has come to also mean whatever is baked and served in it. So. A metonymic theme, which also rhymes with my own IMBB theme of tartines : what more could a girl ask for? 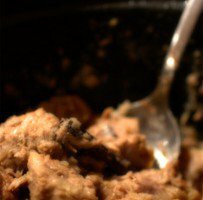 I pondered the possibilities, and suddenly remembered about the Pounti Auvergnat, a terrine that I had tasted, loved and written about a few months ago. 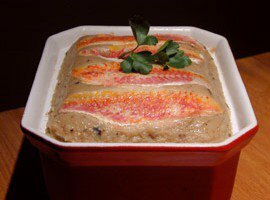 Pounti is a specialty from Auvergne (a mountainous region in the center of France), a meat terrine with blettes (swiss chard) and pruneaux (prunes). 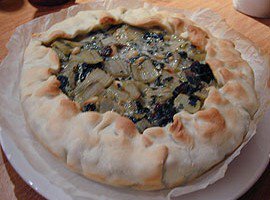 Swiss chard and prunes happen to be two of my favorite ingredients (oh darn I should have called this blog “Swiss Chard & Prunes”, what was I thinking) and I had long wanted to try and recreate this recipe. This was the perfect occasion. Following my usual method, I gathered the different recipes available out there, compared them, discarded the ones that made little sense or called for impossible ingredients (no, I do not have a guinea-fowl handy) and merged the interesting ones into my own version. I decided to use the prunes pits-on, to preserve their shape and juices — just like grandmothers traditionally do with cherries in clafoutis. To say that I was utterly delighted with my pounti would be a droll understatement. Everything went miraculously according to plan (batter consistency, quantity, cooking time), and it was reasonably quick and easy to put together. The result was an appetizing affair, golden and puffy, which unmolded perfectly. 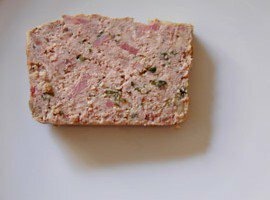 I cut up slices for a weeknight dinner (maneuvering the knife blade as adroitly as I could around the pits) and Maxence and I both loved the unusual and comforting taste of this fragrant terrine. 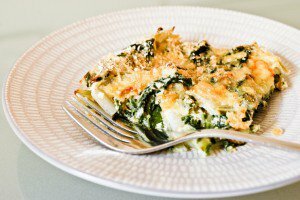 As expected, the cold leftovers were just as delicious the next day, so this would be a perfect make-ahead dish for a dinner party or brunch. 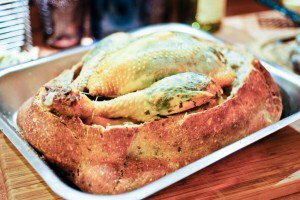 Preheat the oven to 180°C (360°F), and grease a terrine dish (don’t forget to grease the lid if your dish has one) with butter. In a large mixing bowl, beat together the flour and the eggs. Pour in the milk and whisk well. Add in the shredded meat, the sliced onion, the crumbled bread, salt and pepper, and mix again. Add in the chopped chard and herbs, and mix again until thoroughly combined. Pour a third of the mixture in the greased terrine dish. Top with half of the prunes, arranging them evenly to make sure every terrine slice will have a bit of prune in it. Cover with another third of the mixture, top with the rest of the prunes, then pour in the rest of the mixture. Cover with the lid of your terrine dish (or a piece of foil if your terrine dish is desperately lidless) and put into the oven to bake for an hour, or until a knife inserted in the center comes out clean. Switch the oven to grill, remove the lid (or foil) and return the terrine into the oven for five minutes, or until the top is nice and golden. Let rest on the counter for 15 minutes, then unmold. 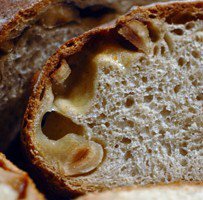 Cut in thickish slices with a serrated knife (delicately pushing aside any pit that the blade encounters) and serve warm, at room temperature or cold. And if you’ve left the pits in, be sure to warn your guests! 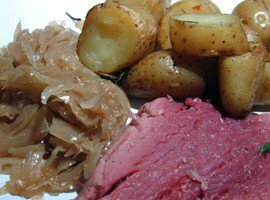 Leftovers are also excellent the next day, and slices can be reheated gently in the microwave or sauteed in a hot skillet with just a little oil.